We are calling these Korean rice rolls “sushi” because at first glance, they do resemble the Japanese rolls that we Westerners associate with sushi. 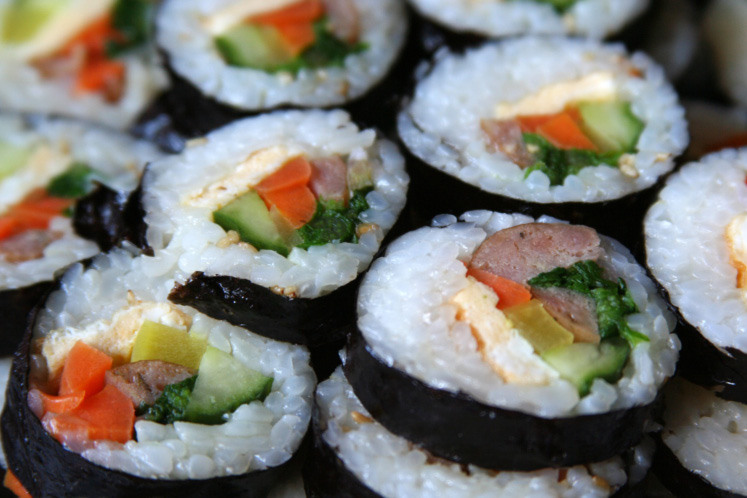 But kimbap is not considered fine or fancy fare in Korea, it's actually picnic and snack food that you eat with your hands. Traditional fillings include seasoned vegetables, egg, meat and/or imitation crab, but these days anything goes. From Seoul to NYC, fillings range from cheesy to spicy to fresh. Kimbap is like the Korean version of a sandwich- you can change the filling to fit any diet, palate, or occasion. 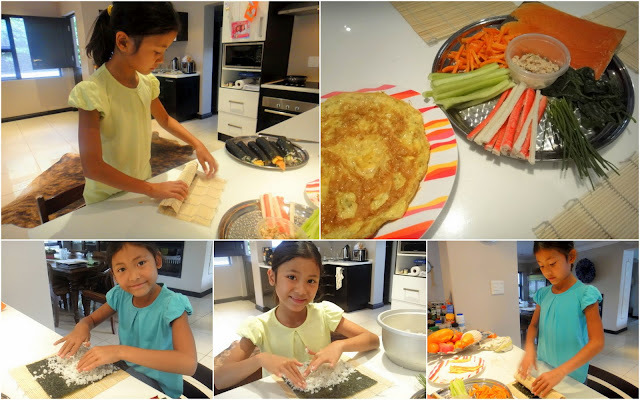 The girls love these to eat at school for lunch, although they are fast I haven't made them myself in the morning yet to give them to school, but as an easy dinner we make them often... or I must say I make them... but today was a different day... now the girls made them!! And they LOVED it, so we will add this food item for sure to our repertoire! Buy some nori (sea weed sheets) Boil some sushi rice, when done add some rice vinegar, some salt and sesame oil and you are good to go! Oh, and we ate some miso soup as a starter.... YUM YUM! Make them with your kids, this is a fun, fast, healthy and easy dinner option!! Here is a LINK from Serious Eats, that will help you assemble the kimbap and gives you some other filling options. ooo I like this idea! Thanks for sharing! those do look neat. I am such a picky eater, there's really nothing else to say. I married a man that wants meat and potatoes, honestly he would eat the bone if he could, I don't even like meat. We are not letting Maya be picky, I don't want her to turn our like me. This is so amazing... I am returning to my blog finally. Can you tell me how to link it to facebook they way you have it and also how do you get the pictures into this cool frame collage ? I think it will simplify things for me if you do not mind sharing. Also I was going to tell you that if you froze a glove with water in it and removed it , it will make a great centre piece for a punch...more a cool ice block for a halloween party your friends were planning.